Very well made, but yet soft. It's more blue than I thought it was from the picture. Looks great in the room. Thinking about buying additional sizes for other parts of the basement! Bring bold colors and beautiful texture into your home with this handmade braided rug. With an abstract stripe pattern that creates a concentric design, this large rug is made from high-quality cotton. My den is brown. Yep, boring brown. The furniture is brown, the floor is brown and the walls are tan. I blame it on my husband being 23 years in the Army and I guess brown is about as far as he could manage from all white or all Army green. I've tried to bring color into the room with accessories but it still looks drab. So, here I find this rug. and now I've got this big splash of color. There are so many colors I think I could use this rug in just about any room of the house. I couldn't tell from the pictures how the rug was made but seeing it - I'll tell you. The rug is like a rag rug that is braided and then each row is sewn into place. It is thick - I'd say 3/4 inch thick. The quality and workmanship look excellent with uniform stitches and even width of rows. I would not use this rug in a formally decorated room but in a casual room - a den, kitchen or hallway this would be a riot of color that could be perfect. The Curated Nomad Grove Handmade Braided Cotton Rug - 5' x 8' is my favorite rug. 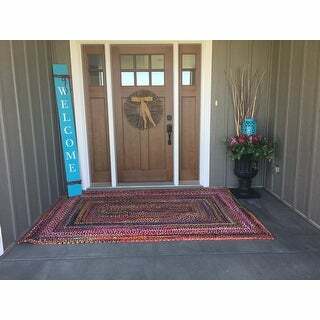 It is just right size area rug in a bedroom, living room, or porch. It is not too thick and very well made. I get a lot of comments on this rug. I do recommend it to all my friends . Beautiful colors. Very well made my 3 dogs and two cats seem to like it. My husband even likes it. I was a little iffy with the colors until we unrolled it and it is really very pretty. Very pleased. Love, love, LOVE it! Beautiful colors and suits the intended space perfectly. So vibrant and tightly braided for durability. The colors are true to the photographs although I can see with the uniqueness of each piece, it could differ slightly, so keep that in mind. I have also vaccumed the carpet without any issues with fraying or pulling. I would recommend an rug pad for the floor to keep it from slipping if you don't have furniture holding it down. Bought this Curated Nomad Grove Handmade Braided Rug for my daughter and she loves it. Looks beautiful in her living room. I ordered this area rug for my wife four weeks ago. And I have to say it is the brightest, prettiest area rug I have seen in a long time. I wondered if it would be to flashy for our living room, but after seeing it, it isn't...Our living room is pretty much brown, or of a brown shade. 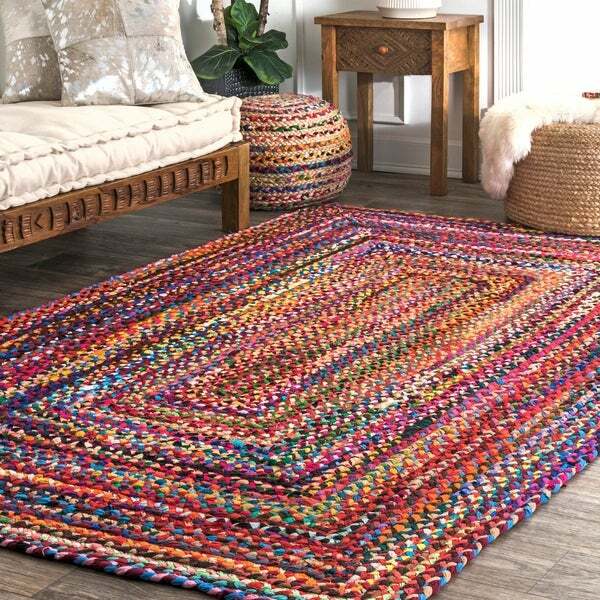 And this braided rug makes the room explode with color. My wife loves the colors and the quality is far better than I expected. The weave is tight and the thickness is good too, about 5/8 to 3/4 of an inch. We put it on our already carpeted floor and have a coffee table setting on it. We don't walk on it, but not due to anything wrong with the rug. 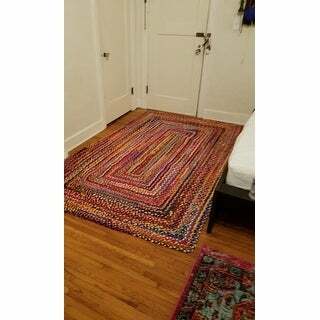 I read in one of the other customer reviews that these braided rugs slide on carpet so before we walk on it we will be getting some non-slip rug pads to put under it. Also: in another review, I read that this particular braided rug stained the carpet under it, so hopefully it won't stain ours. The lady also said her rug seemed a little damp when she unrolled it...Ours seemed to be dry but we are not taking any chances and we will be ordering a non-slip pad and that should alieveate that problem...My overall review is this...I would definately recommend this rug to anyone that is intetested in buying one...Thank you overstock.com...GREAT PRODUCT...!! 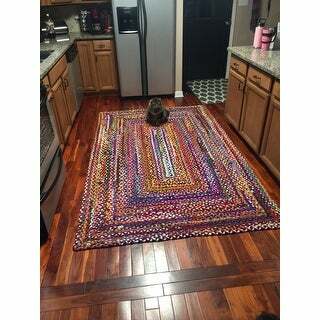 Beautiful and very pleased with this rug..
Beautiful Rug! Exactly as pictured. The colors are exactly as pictured...very vibrant. I'm using the rug on my front porch which is protected from the elements. It looks beautiful. The Curated Nomad Groove Handmade Braided cotton area rug is perfect for my kitchen. We believe that it will wear well and look beautiful. Very satisfied with our purchase! 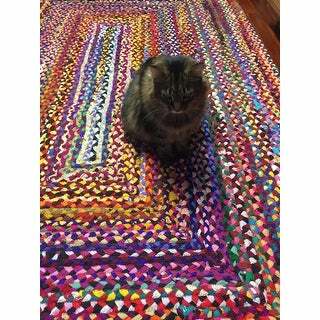 The rug is nice, it lays very well but the colors are not as nice as the photo. Lots of Browns. I would be happier if had looked more like the photo. For the price it's fine. Loved this rug when it first arrived. After a little more than 2 mths. on the floor, some loops of fabric are coming out of the braid. Would never but again. Beautiful. Prettier than the picture. Makes me smile. I read the reviews for this rug before purchasing. My experience has been all positive. It is a heavier (thick) rug but I was able to carry it up and down stairs by myself. I tried it on the concrete floor in my basement and then ended up putting it in a room with hardwood floors instead. It is in front of a closet with hinged folding doors and the closet doors are not a problem with the rug at the bottom. Both times I put it down it did have a couple of humps here and there but I just walked around on it for a couple minutes and stepped them all down. Soon the rug was lying completely flat with hardly any effort. This is not a cheap looking rug; it is very substantial and nice to walk on. The colors are very bright and vibrant. Mine looks just like the picture above. I am so happy I went ahead and ordered this rug! I absolutely love this rug. I live in a studio apartment and needed some color to make it "pop". This rug is perfect! It's large enough that it covers the entire entry of my space, and cuts down on cleaning the rest of my hardwood floors. I haven't needed to wash it yet, but will probably send it out to be professionally cleaned so that it stays intact. I always get compliments on it, and it's one of my favorite things in my apartment! Wonderful splash of color and very comfy under our feet. It is a great addition to our home! I enthusiastically recommend this runner. The price was so right and the delivery was incredibly fast. I trust Overstock for quality, selection, and great service! Thank you, Overstock! The colors are more fitting for a preschool or kindergarten room....the pictures don’t show all the pink and lime or neon yellow that’s truly in the rug....definitely didn’t work for my living room. These vibrant colors are gorgeous and really well balanced -- the rug is not perfectly round but I prefer it that way (you might prefer something more uniform). I love this rug. We got this rug to add a pop of color, we love it and makes me smile every time I walk into the room. I was a little concerned that our dos toes would get caught in the weave,but it is not a problem. 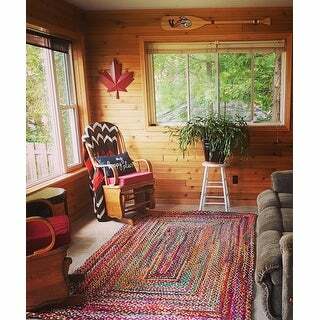 Love the rug. Beautiful rug with beautiful vibrant colors! I purchased the for my dining room. You cannot push chairs on it due to being a braided rug, but I love the colors and it looks great! It was Thicker than I thought it would be and it lays very nice. I put it in my van not in my house and it makes my van look lovely for traveling. Love the colors. Would recommend it. "Will the dyes on this rug rub off on carpet or socks when walked on?" mine is on wood flooring and has not bled colors onto anything. I love it! "Hello Is this Rug Sturdy? I wanted to use it at a beach bar. The measures presented are in feet? How long does it take to ship? Thanks best regards"
Absolutely durable!! It would be perfect for a beach bar. The colors are vibrant! I love this rug!!!!! I’ve bought 3-total plus the round ottoman that matches- which has withstood my feet and my grandsons chair when they come visit me!! "What are the exact measurements of this rug? Is it a true 5' x 8'?" Mine is 5'2"x8'. Very nice rug for the money. Colors are vibrant, everyone that sees it loves it! Yes, it's exactly 5 feet by 8 feet. "Where is the basket in the picture ?" "how do i add this to my shopping cart. i cannot find an order button"
Please visit https://help.overstock.com/help/s/article/How-to-Contact-Customer-Service for additional assistance. "What was used for the dye? Is it non-toxic?" Yes this is non toxic.